Today’s news review looks at coverage of essay writing services, graduate earnings, apprenticeship standards and disadvantaged children reaching university. On Sunday, 14 August, the Sunday Times published a story previewing a report that is due to be published on Thursday, 18 August, from the Quality Assurance Agency for Higher Education (QAA) which looks at the issue of custom essay writing services, also known as ‘essay mills’. The government takes a zero tolerance approach to plagiarism. We are clear that individual institutions are responsible for spotting fraudulent work and dealing with it based on their own sanctions. Plagiarism is not acceptable and on this industrial scale represents a clear threat to standards in our universities. Individual institutions are responsible for spotting whether students are fraudulently passing off work as their own and we expect them to have strong policies and sanctions in place to detect and deal with it. 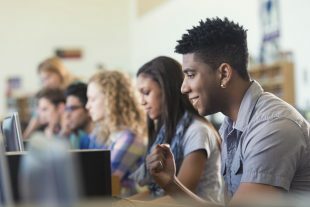 Our reforms, including the new Teaching Excellence Framework, will address this problem by Incentivising all institutions to focus on the quality of teaching and to drive up meaningful student engagement, but we are looking closely at the recommendations in this report to see what further steps can be taken to tackle this scourge in our system. On Sunday, 14 August, there was coverage in the Sunday Express and Sun of a report from the Joseph Rowntree Foundation that criticised the apprenticeship system. This follows figures released by Ofsted that show that nearly half of apprenticeship providers in England have been rated 'inadequate' or 'requiring improvement'. The government is already working on a range of measures to improve the quality and standards of apprenticeships. These include introducing a new register that providers can on be listed on if they are tested and can show they meet a series of high quality standards. We are driving up the quality of apprenticeships so that the training meets the needs of both learners and employers. Apprenticeships must now include substantial training lasting at least 12 months. This week, we have also published proposals on the introduction of a new register of apprenticeship providers. To be on the register, providers must meet be tested to show they meet a series of high quality standards. On Monday, 15 August, ahead of A level results day, education charity Teach First called on the government and universities to ensure university funding is used to engage pupils at primary school about higher education, so that more children from poorer backgrounds don’t miss out. Teach First cite figures from a new ComRes poll that suggest that students from high income backgrounds are more likely to start planning their university applications earlier than their less privileged peers. The story has been covered by the Times and the TES. We are clear that there should be no barrier to any child’s ambitions and we are already seeing record numbers of disadvantaged young people going to university but we want to go further and ensure we are building a society that works for everyone. Through the pupil premium we have invested billions to help disadvantaged pupils and it is paying off with the attainment gap narrowing at primary and secondary level. Additionally, universities are already required to work with schools and colleges to reach disadvantaged pupils, and for the first time our changes to Higher Education will link the assessment and funding of universities with their performance on widening access. Teach First is right to emphasise the importance of inspiring ambition in school pupils from an early age, including encouraging more children from disadvantaged backgrounds to prepare for and apply to university. Teach First's report is in tune with the Government's objective of improving social mobility and ensuring all children, regardless of background or ability, are able to fulfil their potential. That's why we attach such importance to raising reading standards in primary schools and why early fluency in the basics of arithmetic for every child is a central tenet of the new primary curriculum. It's why we emphasise the importance of more pupils taking the core academic subjects at GCSE, the subjects universities have said ‎increase opportunities to gain university places.